Being new to the windows mobile world I am slowly, but steadily being introduced to the crappy built in programs and having to replace them one by one. One of the crappier bundled programs is the calendar app. Not only did it take me a few days to figure out the best way to import my google calendar events onto my phone, which I will address in a later post, (I tried about five different methods) but once I got them onto my phone they were pretty much useless. My calendars were no longer color coded leaving every event looking exactly the same, a grey triangle in the upper right hand corner of the calendar day. Enter Pocket Informant 2007. Not only does it keep my calendars color coded, but it launches into the view that you closed it in (ie, I like having my calendar open to a month view so I can quickly see any upcoming events - I couldn't figure out how to do that in the built in calendar app). At $24.95 Pocket Informant is a steal. It has so many features that even after a week of use I am still discovering new ones. 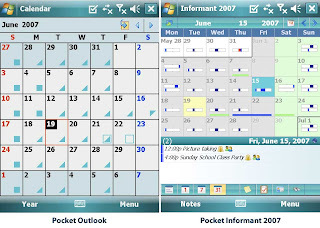 I highly recommend giving Pocket Informant a try if you're as fed up with the windows mobile calendar app as I was. Download a cab for Pocket Informant here.